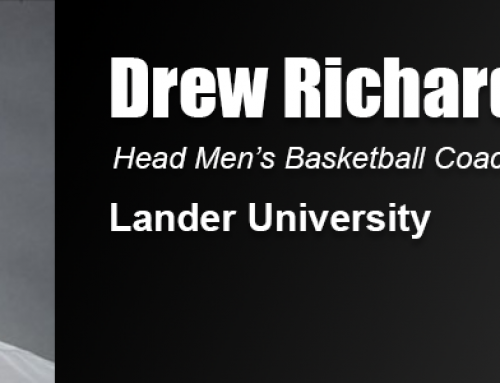 DAPHNE, Ala. – Dr. Sandra K. Geringer says the United States Sports Academy has opened doors for her in many ways, including the opportunity to teach abroad, earn her doctorate, and teach Academy students as the newly appointed Director of Sports Studies. 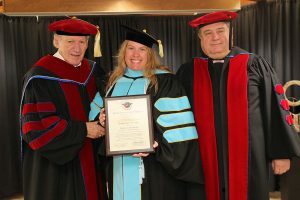 United States Sports Academy Director of Sports Studies Dr. Sandra Geringer, center, recently earned her Doctor of Education degree in sports management from the Academy. She is pictured with Academy founder and President Emeritus Dr. Thomas P. Rosandich, left, and Academy President and CEO Dr. T.J. Rosandich, during a graduation ceremony at the Academy campus in Daphne, Ala.
Geringer recently completed her Doctor of Education degree in sports management with an emphasis in sport marketing, with honors. She began her doctoral studies with the Academy in 2015 and worked her way up to become the Acting Director of Sports Studies in 2016. At the time, she was taking Academy doctoral courses while also teaching students. The “acting” portion of her title was removed after she completed her doctorate, launching her career as Director of Sports Studies. “Earning my doctorate and the title of Director of Sports Studies was an honor and a relief,” Geringer said. “It was a lot of hard work, but I was always motivated because I knew that one day I would get to this point and be able to focus on teaching. I am truly grateful to the Academy for giving me this opportunity. 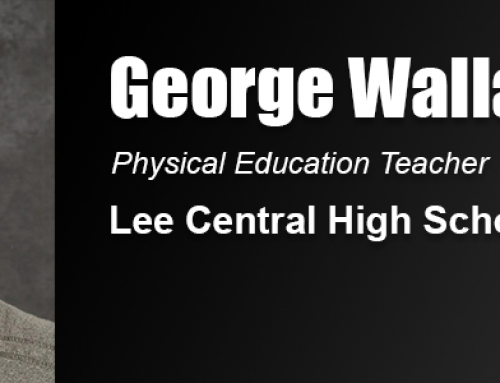 Geringer has an extensive background in both education and sports. She was a member of the women’s varsity tennis team and earned a bachelor’s degree in education with a major in sports management from Bowling Green State University in Ohio in 1997. She earned a master’s degree in education with a focus on higher education administration from the College of William and Mary in Williamsburg, Va., in 2011. Geringer served as assistant director of special events for the athletic department at William and Mary and summer recreational coordinator at the Chagrin Valley Recreation Department in Chagrin Falls, Ohio. Geringer has extensive experience as a tennis professional and has coached women’s and men’s tennis teams at the high school and collegiate levels. She was the interim head men’s and women’s varsity tennis coach at Cleveland State University in Ohio. She has held the position of tennis professional in the resort, private club, camp, and recreational settings for more than 15 years. Geringer’s entry into the Academy’s doctoral program was closely associated with her interest in international teaching. “I Googled ‘international sport programs’ and I found the Academy, and it turned out to be the right place for me,” Geringer said. “I read about the Academy’s instructional programs in Malaysia and I thought it would be a great opportunity to have … someday. “I applied for the doctoral program and two days later, I was interviewing with the Academy to go to Malaysia. I went to Malaysia for two months and it was an amazing life experience. 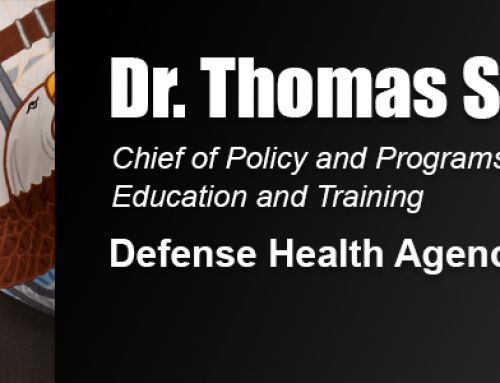 When I got back, I contacted Academy Founding President Dr. Thomas P. Rosandich and told him how valuable the experience was for my personal and professional growth. 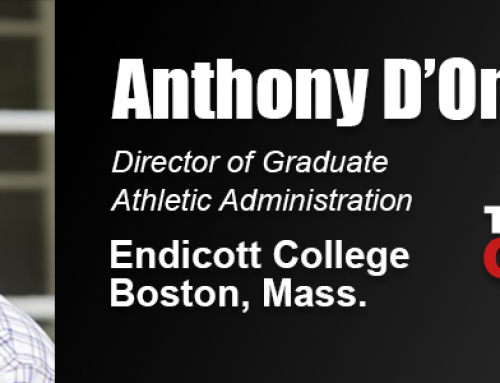 In January 2015 I began the residential program and my graduate assistantship. “The Academy has given me all kinds of fantastic opportunities to travel,” Geringer said. “I went to Abu Dhabi in the United Arab Emirates to do a presentation. I taught in Malaysia and Thailand. And, I conducted a sport tour in Atlanta, Ga., with a group of elite coaches from Shanghai. I have had experiences that I never thought were possible. Her doctorate came with an emphasis in sport marketing, something she chose because of her extensive experience in the hospitality field. Regarding her future teaching, she hopes to impart what she has learned in her earlier career to future generations of Academy students. In one of her study courses with Academy Dean of Academic Affairs Dr. Stephen Butler, Geringer created the orientation program for Academy graduate students. For her doctoral dissertation, she studied the orientation program to determine its successes.  Sports Studies at the Academy is a field of study in which students create a sport-specific curriculum tailored to their interests in the sports world. In addition to her teaching, Geringer recently has had another important assignment at the Academy: serving as coordinator of the Academy’s documentation process for the periodic review by its accreditor, the Southern Association of Colleges and Schools Commission on Colleges (SACSCOC).